Recognition of Prior Learning (RPL) is a process through which the skills of an individual can be assessed and recognized. Objective of this certification scheme is to enable a large number of youth to take up industry-relevant skill training that will help them in securing a better livelihood. RPL mainly focuses on the individuals engaged in unregulated sectors. RPL is a key element under Pradhan Mantri Kaushal Vikas Yojana (PMKVY) scheme of the Ministry of Skill Development and Entrepreneurship (MSDE). The scheme plans to impart skill based training to one crore people between 2016 – 2020 and RPL will account for 40 lakhs candidate whose prior experience and skills will be assessed and certified. 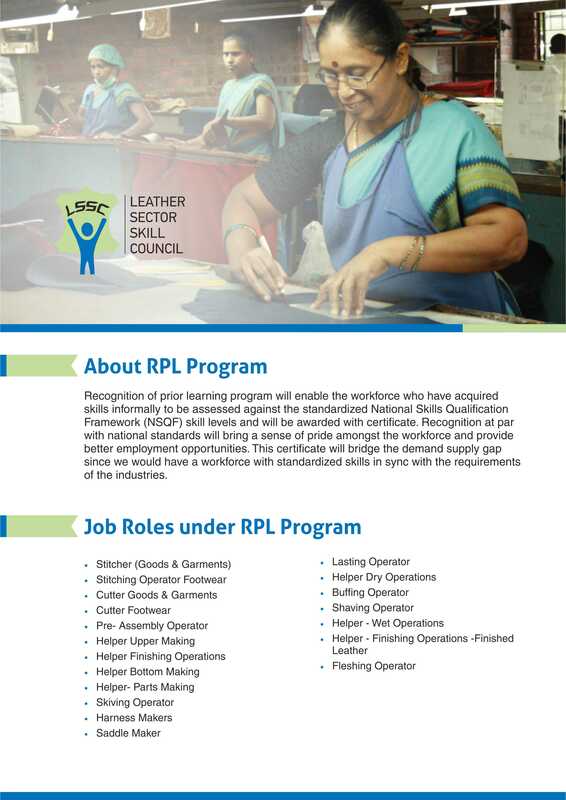 RPL is the most effective means of recognizing the existing knowledge, skills and experience of the existing workforce in the leather sector. It is estimated that between 2017-2022, a total of 2.39 additional jobs would be created in the leather industry. This includes 0.88 million full time employees in leather manufacturing, 0.77 million workers in micro enterprises, and 0.74 million in daily wage/self-employed workers such as cobblers. 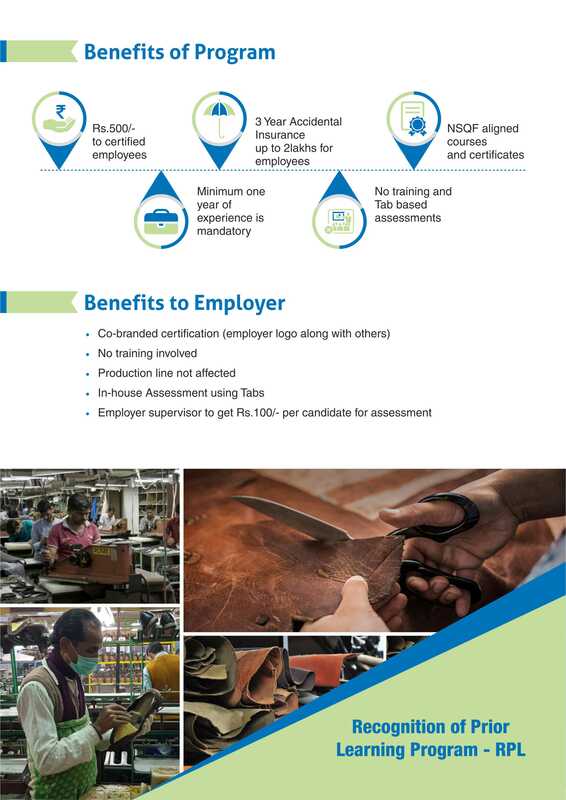 Since a major part of the leather industry is unorganized and operates in the MSME sector, it’s a challenge to provide job-specific training to the workforce. 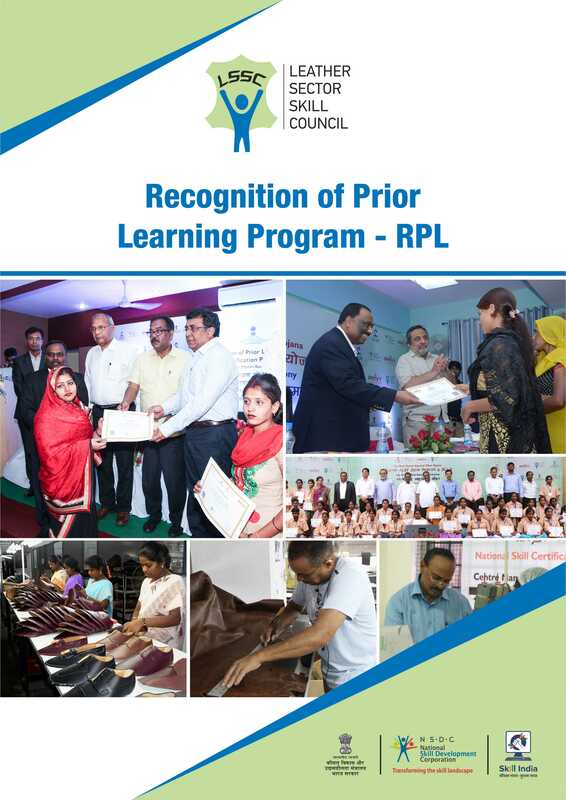 RPL provides a great opportunity for skill development of their workforce who would have learnt the skills on their own by following the 5-step process. Click the images to download or earn more about RPL. The key objective of this project is to undertake RPL and certification of already employed workforce in the leather sector. 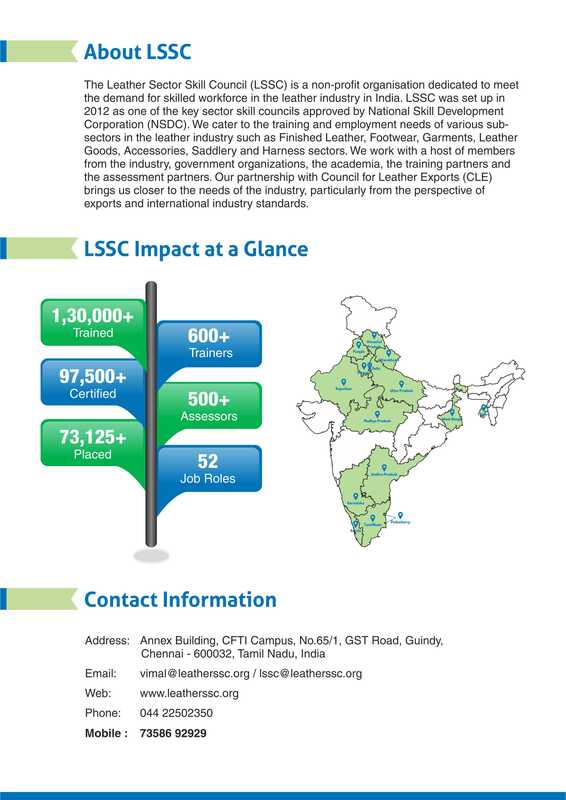 The project aims to address a large unmet need of the industry as well as the workforce in the Leather industry. The project aspires to certify workforce with experience in various job roles to get certification aligned to various QP’s and in turn make a difference in real income by enabling them to get paid according to their skill level. A majority of workforce in the industry lacks formal training. However, many of them would have gained experience and trade know-how while at work. Our RPL facilitators have designed and use a proven framework to assess workers and identify skill gaps. Deployment of Recognition of Prior learning (RPL) by trainers ahead of the start of training is conducted to evaluate current skill levels of the learners and design the training plan. Before any training program is undertaken, it is critical to understand the current skill levels of workers. Most informal sector workers today have significant tacit knowledge that is not recognized. Our RPL assessment measures the current skill level of a worker. This allows us to assess their training needs and also sets a baseline for aligning wage level to skill level. Through RPL assessment and certification, the candidates will be able to align existing competencies with the National Skills Qualification Framework (NSQF) for better opportunities in employment and higher education. Besides creating an equitable system, RPL also helps them explore different options in skilling and upskilling to bridge the knowledge and skill gaps. Cost effective and efficient method (time-wise), since there is no duplication of learning) to build the skill levels in the organization. Provides the employer the flexibility to make scientifically based different wage/compensation plans linked to workforce skill levels.